Kitchen design can be one of the hardest things an interior decorator can work on. The kitchen is such a different environment from any other room in the house that making it look amazing and welcoming requires a lot of attention. Sometimes, things get even trickier when it comes to Kitchen design ideas because you are working with a really small space. A kitchen is hard to design, but a small kitchen can be dreadful to think about. However, that doesn’t mean that it can’t be done. In the end, by taking a few ingenious tips, you can come up with a really cute and efficient kitchen that will satisfy you not only visually but also when it comes to utility, like having a proper Kitchen worktop. Speaking of Kitchen worktops, that’s just one of the many elements that you need to work out in your design. Take a couple design cues from this piece in order to make your small kitchen look amazing. The cutting board is an essential part of any kitchen. It’s one of the elements most used in the kitchen during the cooking process, but it can often take too much space out of the room. A great way of saving space is by getting a removable cutting board which can be mounted over the sink area. This way, when you’re not washing your food, you can cut it up in the same place. It gives you plenty of room for other appliances or functions. One of the main problems with small kitchens is the fact that they’re small. This can be changed as well, even if it doesn’t seem that way. Replace your existing backsplash with one made of mirrors. This will make the room look a lot larger and thus completely change the vibe of the room as a whole. It’s a smart trick that can help you bring more life into your small kitchen. 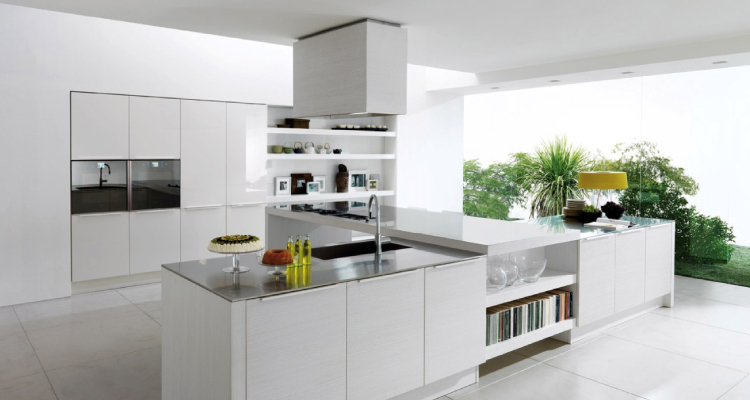 Many kitchens lack the potential of providing the user with plenty utility. Don’t buy kitchen furniture that only provides depositing or working space up top. Instead, get furniture that comes with shelves or drawers. This will maximize the space in your kitchen and you will be able to make use of every inch in the room, as opposed to just placing things on the limited space on top of the piece of furniture. If you’re finding it difficult to picture everything in place, use the Visualiser in order to better plan out your future kitchen design. The Visualiser is a tool that lets explore kitchen design with more ease, so that things are better drawn out when you start the actual kitchen design process.